APEX Race Parts is a renowned California based designer and manufacturer of high performance, FlowFormed wheels, wheel accessories, performance and race parts for leading automotive brands like BMW, Ford Mustang and the BRZ/FRS chassis. 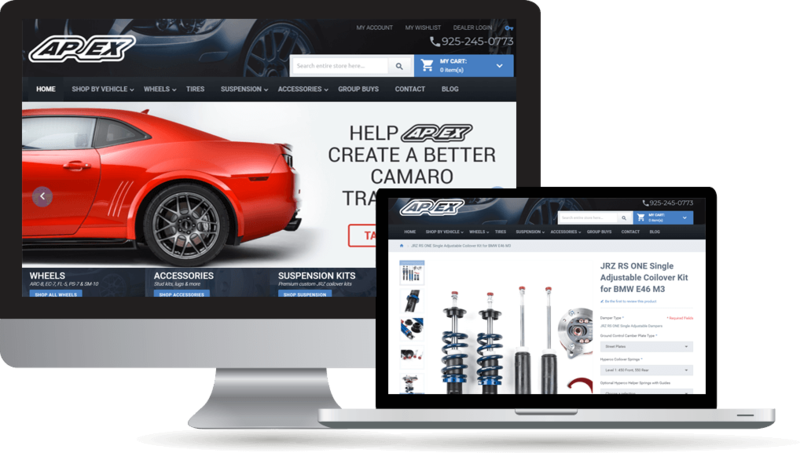 Apex Race Parts ecommerce store was built on the Oracle-NetSuite’s legacy Site Builder ecommerce platform, which was neither mobile friendly nor offered much room for customizing the store’s functionality or user experience, both of which involved considerable effort and cost. Due to these limitations, the company wanted to move their ecommerce operations to Magento and was a looking for a Magento Partner to assist them with the transition. Thanks to Folio3’s efforts, Apex Race Parts was able to go live with a brand new, Magento based web store within the short span of 12 weeks. The new site received was very well received by Apex’s customers who now could now not only access the store from their mobile devices but also get a much more streamlined and faster shopping experience. Thanks to the new site, Apex experienced an almost 30% increase in their online sales post-migration, within the first quarter. Pleased with the results, Apex Race Parts has engaged Folio3 as their on-going Magento development partner for providing maintenance and support for their Magento web store. The partnership is now in its second year.